Maybe it’s the spring weather that inspires us to get things done. Take advantage of that energy and do some spring cleaning, starting with your car. Last month, we talked about getting your motorcycle ready for spring. We don’t want your car to be left behind, which is why this month Mooresville Synthetic Oil wants to talk to you about spring cleaning your car. Take advantage of the longer and warmer days and give your vehicle a thorough cleaning to extend its longevity and performance. 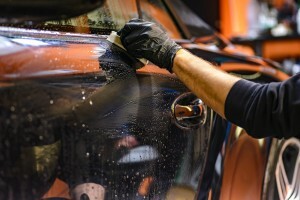 If you’re considering selling your car, a good cleaning can increase its trade-in value. On to the spring cleaning tips. Part of spring cleaning your car should include maintaining its systems. What’s the use of a beautiful and shiny vehicle if it doesn’t work? A well-maintained vehicle is more powerful and friendlier to the environment. Start by checking the tires. Winter roads can be harsh on them. Verify that the air pressure is right and that the tread isn’t worn out. If your tires look old and worn, you might need to replace them. Move on to your brakes. If you’ve heard your brakes squeaking lately, they need some attention. Perhaps you need to refill the brake fluid. In fact, you might need to refill all of your car’s fluids, including the oil. It’s the perfect time to get an AMSOIL Synthetic Oil change to keep your engine in top performance. You can get your oil and oil filter at AMSOIL’s online store or by calling Mooresville Synthetic Oil at (336) 247-0212. But your maintenance isn’t over just yet. You should also check that the battery has enough power and that the air conditioning is working. With the temperatures rising, you don’t want to be stuck in a car with no air conditioner. Maybe you will need to change the air filter, so pollen and other contaminants don’t make their way into the cabin and affect your health. The easiest thing you can do to become a better car owner is to keep your car clean. Give your car’s exterior a thorough wash and maybe even a wax. Try not to wash and wax your car under direct sunlight. Use a mild soap and pay particular attention to the cracks, under the edges, and the wheels. If you choose to wax your car to make it nice and shiny, be sure to you a wax that’s compatible with your vehicle’s paint. There’s not much to cleaning your car’s interior. Some vacuuming and dusting, a wet rag, and an air freshener and you’re set. Start by using a brush to wipe down your seats before you vacuum them. There’s probably food crumbs, dust, dry leaves, and other junk found there. If you own leather seats, you can wipe them down with a damp cloth and cover them with leather protector. Don’t forget to vacuum the mats and underneath them as well. If there are some areas that your vacuum can’t reach, use compressed air. Use a wet rag to clean your dashboard and a clean cloth to dry it. Be careful not to get any water in the electronics! If your pet travels with you often, don’t let your hard work go to waste and pet-proof your car. Finish your interior cleaning with an air freshener, and you’re set. April comes with its refreshing showers. Those lovely rains can be very dangerous if your wipers are not working while you’re driving. Your windshield wipers should be replaced twice a year, and spring is the perfect time for it. If your wipers are looking dry and cracked, if they make annoying noises, or if they smear your window, they need to go. Keep your window safe and cleaner with new wiper blades. Raise your hand if you’re guilty of using your car as a trashcan/closet/dining area. If you are one of these people, you’ll probably find empty coffee cups and bottles, food wrappers, and even a few pieces of clothes. It’s easy for you to forget they are there, but your car certainly feels it. That extra weight you carry in your vehicle is probably making you spend more fuel. So do yourself a favor and get more mileage out of your gas tank by clearing out the trash and everything you don’t really need from your car. Enjoy the benefits of getting a synthetic oil change this season by switching to AMSOIL Synthetic Oil. You can find everything for your oil change, from their long-lasting XL 10W-40 Synthetic Motor Oil to oil filters at AMSOIL’s online store. You will also find most of the main fluids your car needs to stay in top performance. Alternatively, you can call Mooresville Synthetic Oil at (336) 247-0212 to get some recommendations and stock up.